Made from 25 hectares of vines in the Côtes des Bars in Aube, in the south of Champagne, about 45km from the region’s historical capital of Troyes. The marly limestone and clay Kimmeridgian soil both preserves acidity in the grapes whilst encouraging a round, rich, bolder fruit profile. This soil, combined with slightly warmer temperatures, makes Côte des Bar Champagnes broader and softer than the wines from the north. Pale lemon green, persistent medium bead. Bready, with white fruit and white blossom on the nose. Balanced acidity, gentle mousse, round and approachable with pleasant, fruity length on the palate. Reasonable autolytic character, everything in its place. Well made and most drinkable. Particularly good value. Located in the Premier Cru vineyard area of Vertus in the Côte des Blancs. Veuve Fourny separately vinifies parcels of grapes from about thirty different “lieux-dits”, where the soils are mostly calcareous, containing very little clay, and with some areas of pure chalk. Slightly deeper in colour than the Gremillet, with a similar size and persistency of bead. Yeasty and complex on the nose, drier, more savoury and less overtly fruity. Dry and with a refreshing leanness to the palate, the apple fruit balancing the firm structure. Although drier, this felt richer than the Gremillet. The mousse was slightly frothier in texture and it had a more prevalent yeasty autolytic character. Reasonable length. More “serious”, but definitely an apéritif/food wine. The Paul Déthune winery and vineyards are located in the village of Ambonnay in the Montagne de Reims region. Farming organically and biodynamically as much as possible, the house produces Champagne entirely from Grands Crus vineyards. A drive towards sustainability also extends beyond the vines: since 2004, solar panels produce 20% of the estate’s electricity and the collection of rainwater reduces its water consumption by a similar amount. A pale biscuity gold, with a fine, slightly lazy bead. The nose was gently earthy with red apple skin notes that ran through into the palate. Riper and rounder than the Veuve Fourny previously and with more flesh on its bones, thanks to a higher dosage. Earthy/forest floor/yeasty characters were balanced by the ripeness of the fruit and by the firmish texture of the mousse. Very good indeed. 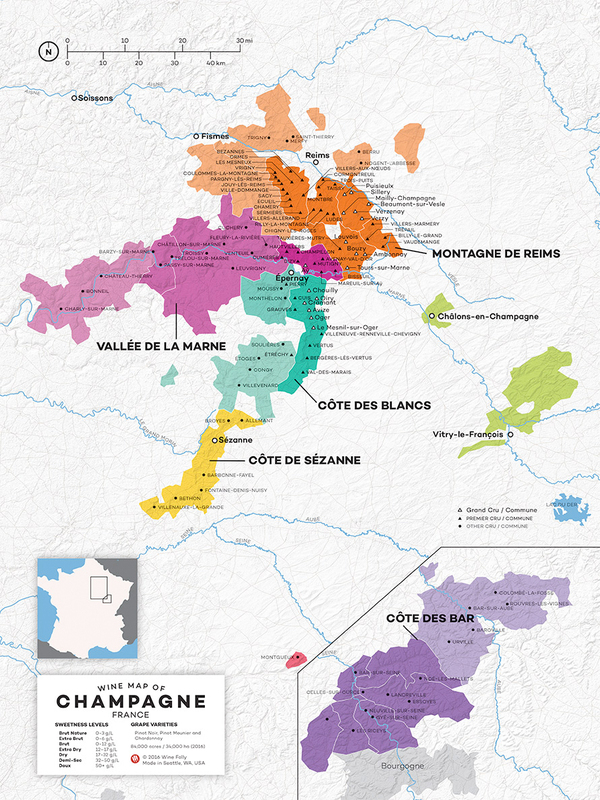 Lallier is based in the famed Pinot Noir territory of Aÿ, also home to Bollinger, and naturally both houses favour Pinot Noir dominated blends. 100% Grands Crus, the Pinot Noir is from Lallier’s own vineyards in Aÿ whilst the Chardonnay is sourced from contracted growers in Avize and Cramant in the Côte des Blancs. Greenish lemon hue of biscuit, with a fine and gentle bead. Toasty, buttery and brioche on the nose. A weightier style, with a Pinot Noir savouriness, a creamy richness and a touch of honey to the citrus fruit. The palate echoes the toasty brioche characters of the nose, with good length to the finish. Very enjoyable – a more than acceptable alternative to Bollinger! Quite a deep salmon pink, with a fine, energetic bead. Ripe, fragrant red berry fruit on the nose, intertwined with a subtle yeasty note. The similarly berry-fruited palate had an elegant fennel seed spice and a savoury edge, with a touch of tannin. Firm but delicate mousse. Complex and moreish, the fruit was tempered by a fennel and raspberry pip bitterness on the long finish. Very fine indeed. Pale lemon green, with a refined smokey, toasty nose. Dry and firmly structured as expected, yet somehow less overtly acidic than the standard blanc de blancs cuvée tasted earlier. Delicate and less obvious on the palate but coquettish – an alluring tease of a wine. Savoury rather than fruity, the impression was of freshly baked, crusty bread. Light in body it might have been, but it was also harmonious, balanced and long. Elegant and excellent. Founded in 1818, Billecart-Salmon is one of few major Champagne houses that is still family owned. The Billecart family cultivates 100 hectares of vines on its own estate in Mareuil-sur-Aÿ in the Vallée de la Marne, and purchases grapes from a further 300 hectares across 40 crus of the Champagne region. Using a process known as double cold settling, whereby the first press juice of each grape variety and vineyard is rested in small thermoregulated stainless steel tanks before racking and allowing it to settle and precipitate once again. This naturally removes unwanted solids and wild yeasts before the fermentation begins. Chef du Cave François Domi also vinifies the wines at low temperatures to preserve the delicate aromas and the purity of the fruit in the signature Billecart-Salmon style. Biscuit yellow coloured, with surprisingly pronounced toasty oak aromas on the nose (20% of the cuvée was vinified in oak). Rich and full bodied, with firm acidity that balanced the toasty and oaky flavours. Savoury rather than fruity, although zesty citrus notes poked through the yeasty/oaky/minerally characters. The soft mousse gave a lovely texture, and the finish had great length. Very classy and will age well, but not quite what I was expecting. Thank you to Simon for a very interesting selection of Champagnes and for a very informative evening. Who would have thought that a Brut Nature Champagne - a style which all too often I feel that houses make only because they can rather than because they should - would have been my favourite wine of the evening? In Veuve Fourny's case however, even though it works with very low dosage levels anyway, not only was it an interesting addition to the range, it was a very commendable wine in its own right. I look forward to drinking it again soon.